Here are a selection of products that we Sell. To Purchase simply click on the ‘Buy Now’ button and you will be redirected to PayPal to make payment. We aim to deliver ours goods between 3-5 days. The Bluebeards Revenge ‘Deluxe’ Kit consists of a pre shave oil, beard reducing shaving cream, post shave balm, “Doubloon” shaving brush and silver technology anti-perspirant deodorant. Designed to moisturise your beard prior to applying your favourite Bluebeards Revenge shaving cream, the pre-shave oil helps your razor do all the hard work providing a smoother shaving experience and doing it’s own bit to eliminate nicks and bumps. To use massage a splash of oil into your beard until it is barely visible as just a sheen, then get to work lathering up with a quality shaving cream. Shave and enjoy. Treat yourself to this unique, luxurious and soothing after shave balm! After you have enjoyed the ultimate shaving experience for real men why not treat your face to a luxurious, soothing and moisturising application of The Bluebeards Revenge post shave balm. 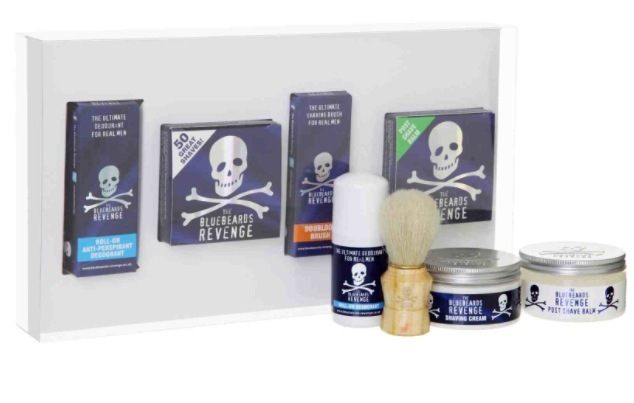 Specially formulated with Witch Hazel and Aloe Vera to nourish the skin after shaving, not only will it make you feel a million dollars but it also contains Decelerine – the active ingredient in The Bluebeards Revenge. Using both the shaving cream and post shave balm should, in time, reduce your beard growth. A great budget brush, ideal for wet shaving beginners or as a travel brush! We find that many men have long forgotten the pleasures of wet shaving and the obvious benefits it has over using an electric shaver. The first step is to get the right kit and a decent shaving brush is essential. Now shaving brushes can cost anything from a few pounds to literally hundreds for pure badger bristle varieties. However, we have opted for the sensible option and offer a perfectly good quality shaving brush at a budget price. This wooden bristle brush comes with attractive gold lettering and our trademark skull and crossbones in gold. Perfect for use with The Bluebeards Revenge shaving cream!